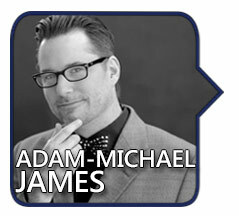 An expert at continuity, Adam-Michael James has a long history in the entertainment industry. He spent two years writing script coverage for film production companies such as Centropolis Entertainment, Carsey-Werner-Mandabach, and Beacon Pictures. He also has three years’ experience writing continuity scripts for radio. His exposure to the television industry through his work as an agency assistant and background actor give him a unique and qualified standpoint from which to write The Bewitched Continuum. James’ literary output includes the book and lyrics for the musical drama The Nine Lives of L.M. Montgomery, Extra Extra! : Memoirs from a Piece of Human Furniture, a humorous how-to book on being a Hollywood extra, and the novel Undo the Deed, a time travel story with a child abuse theme that was influenced by Bewitched. Since 2009, James has been a columnist for soapcentral.com, where his commentaries on the continuity and structure of the soap opera The Bold and the Beautiful reach an estimated 250,000 readers. He also appeared frequently on soapcentral.com’s corresponding Internet radio show, Soap Central Live. For more information about Adam-Michael James, please visit adammichaeljames.com. Pick up a copy of Adam-Michael’s book, The Bewitched Continuum in paperback and Kindle versions. October 24: In honor of Bewitched‘s 50th anniversary, Adam-Michael talks about his new book, The Bewitched Continuum.